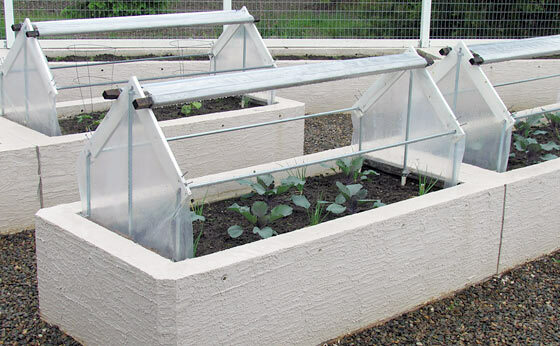 Okay lets open it up for discussion… What are your thoughts and ideas about dealing with cold weather and raised garden beds? Sweet beds, would cost me an arm and a leg over here, we’re at 230/yd in my zone. As I related to Ken, “work and expense, yes but isn’t prepping an investment in the future? Durability, sustainability, some some visual candy are fun to achieve”. Because of my background, construction comes easy, but in recent posts, others had suggested ways to do raised beds at little or no cost. Add, about 10-12 yds. of concrete for 20 planters if memory serves me correctly. I’ve been looking at using block to do beds, can stack and fill pretty easy, the other thing I’ve been looking at are those keyed retaining blocks, are easy to work with, and then if I want to take it down at some point I can as long as I don’t fill them with concrete. I get sorta lazy though and like to be able to just run my tractor through the garden with the tiller on it. Money has been short lately so have to just keep it simple. “Take them down” I didn’t mention that these planters can also be move easily – dig out the soil, put 3/4″ rods through the lower drainage holes and lift – okay you might need a backhoe or crane, but I love big toys. Ha, gotta set up a tower crane and slip forms, do some serious building. My next house is going to be a tilt up, then do poured flat roof, am working on design, is 4 pods basically. The largest one is kitchen, dining and living area, 30’x30′, 2 of the corners completely open up, doors hide in pockets at the adjacent corner, 2 smaller pods are master bed and bath, 20×20 and a 14×14, then 4th pod is a garage and rec room. 24×24, roof connects at corners, is laid out around a courtyard with a pool in it. 30′ and 24′ spans? That would be quite a span for a concrete slab. If so, maybe think precast deck with poured slab on top. A cheap and beneficial wall material is drywall! So good as it makes use of discarded, free, material. Set it up against wooden stakes, 1 or 2 layers thick by however high, wide, you want to go. The gypsum is good for the soil as it decomposes. Over here it rains so much and humidity is so high that after 6 months all I’d have left are the stakes. These beds are absolutely beautiful! I, too, live at the 45th parallel. Extending the growing season is a must. Elliot Coleman’s book “Winter Gardening” is a big help. Thanks for the pictures, Hermit US. I love Elliot Colemans books, his New Organic Gardener has been my bible for farm stuff, he is spot on with everything from scale to technique, even with the huge difference in lattitude lots of his stuff works well. And I ‘b**ch**’ about the cost of concrete blocks? On the base cover for the garden area, have a couple of questions. 1) Did you lay down weed guard before the gravel base, or did you lay down weed guard and 6mil black plastic to reduce the production of weed growth? 2) How thick is the gravel base on this project, and did you compact the gravel to discourage weed propagation in the garden area. Would like to landscape the yard where I have less work for raised bed garden without using a machete to find the boxes. This years rain we had thick weeds over three feet tall by time I could get to them. As a neighbor states “work smarter–not harder”. Just like NRP’s property, we have all rock/gravel. The odd weed does come up but is easily pulled – no need for a ground cover. We had to import the top soil (all the soil mix). I love the superb drainage and clean walking – DW likes no mud tracked into mud room lol. The raspberry rows contained by V-trellises in the lower garden are planted in trenches filled with soil mix. There I do have to weed whip because raspberries spread and even come up in rock. Wow! Wish I had the money to do this, sure is pretty. We just plow and plant. Right now its all we can afford to do. But we can pretty much grow year round. Not much cold weather to deal with. I think we had a few days. Right now we are fighting bugs. That is a beautiful garden! Down here I can grow certain vegetables year round. But I do use a cheap mini greenhouse for seedlings when its not yet warm enough out for that type of plant. I took a sterlite plastic storage container, cut the top out leaving about a two inch border, and taped clear plastic sheeting on the inside of the cover. It works fine. I really like this set-up. We have a couple of raised beds already and this will be a cheaper alternative than a greenhouse. As you mentioned I have ROCKS for soil, hence I have Raised Beds, plus I’m old and fat and HATE to crawl around on the ground much anymore. I have used Simons Concrete Form panels to form up my beds, they are pined at the corners and at adjoining edged, the panels are 2’X4” approx. 2.5” thick, so I lay them 2’ high for the perfect height. The beds end up 4’ wide and 8 or 12 foot long depending what I will be using them for. I lay heavy woven black plastic down first and build on top. I believe Ken has a picture on one of his articles somewhere. I fill the first 12” with junk soil, no need for high dollar mix 2 feet deep (plus it helps retain moisture), than use a very rich mix of compost/peat-moss/manure/dirt (when I can find some) for the last foot. Every other year I remove all of the top mix onto a couple of sheets of plywood, and add/stir in more of the compost/peat/garden soil. This also helps breakup the soil that gets compacted to allow air infiltration (roots need air also). I do see you ‘mitered’ the corners…. Smart. If your doing it right the soil in the raised beds shouldn’t even need to be dug much, should be real mellow and soft as nobody is packing it down, in theory anyway, I’ve seen some dopes doing stuff though that would make you cover your face in bewilderment at the stupidity. The soil mix I described remains fairly “lofty” so when the root masses of the previous crop are removed, replacement is accomplished with more composed soil mix and some peat moss. I dig it in with a fork that has 4 tines bent at 90 degrees and are about 6″ long. I do hot/cold plumbing PVC over rebar in the garden beds, although this arrangement is certainly prettier! I throw a piece of plastic over the top and weight it down on the sides and ends. Greens up through the end of November, and by the time February rolls around everything is ready to harvest again. I would love to do the square foot gardening! I know it won’t be long before we cannot bend and get on our knees (Well it’s already getting hard…lol..we are getting older) I need to start slowly getting the supplies I need to do it. Just the cost right now. For the “junk soil” do you think hay could work? What a beautiful view too! Let me mention a much greater problem when using hay or cow manure in your garden. This is for hay for which you do not know how it was grown. Many hay producers use weed killers (I will not name the weed killers here) in their fields to get a nice looking bale of hay free of weeds. The residue weed killer (even after the hay passes thru a cow) will get into your garden soil and your garden will not produce again. The labels on the bottles of weed killer also warn users of this problem. I also wonder what effect the weed killers have on the human body after we eat the cow. I mention this because I own/run a cattle ranch here in Texas. Beef that tests positive for weed killers can NOT be sold as organic which is a large part of my business. If the beef is not sold as organic it can be sold to the public; which is most beef. Are you still hungry? A neighboring ranch just turned and planted all new Hey, “more Roundup resistant” so they can just spray, spray, spray, killing every weed known to mankind and yet it does not affect the Hay. Great stuff for sure, and yes the Hay goes to dozens if not hundreds of ‘feed lots’, enjoy that Steak tonight. Have another neighbor that has a poor in ground Garden every year, for the life of him he can’t figure out why. He gets Hay and manure from the ranch and layers it on the entire Garden to “kill the weeds” at the same time poisoning the soil and killing the plants, than turns the old Hay into the ground …… Oh course he’s also the type that won’t listen to a “dumb old fart” like me …. Ohhhh Well. I did not know that piece of info about that hay! Thanks! I will NOT be using hay. Ya know when I first looked at your Garden, I must admit a special song popped into the brain, yep you guessed it. Back in from wood cutting now. Thanks for all your great comments. I have read good ideas from many including NRP – forms, earth mover tires, cat tracks, blocks, … whatever your minds can come up with and your pocketbook can afford. One thing I considered was the width of the planter so I could reach for seeding, weeding, harvesting – An eight foot tire would be too much of a stretch for me. Regarding compost – rabbits are prolific dumpers and chew all the straw and grass hay I give them and voila – nutrients I need for the compose pile. Hermit, This is a beautiful and functional garden for us 60 somethings. DH is impressed too! He says we’ll do this when our wooden raised beds fall apart. Love the clean look. It’s still too cool and wet to plant here. I’m thinking that once we get back from our road trip will see what I can plant. We have a raised bed using concrete blocks but this year it’ll have to be my buckets that I’ll use. Last year I used tomato cages and clear plastic trash bags to fashion individual greenhouses for the buckets. We’ll need to do the same this year. Thanks for all the compliments but he design is fairly simple. 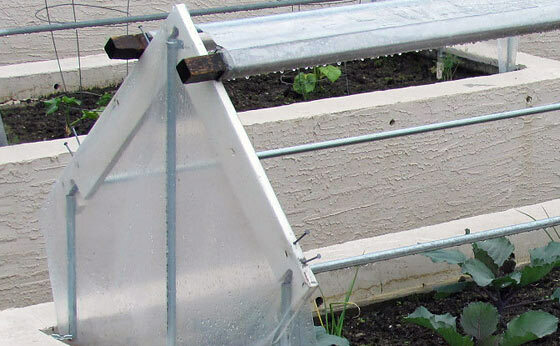 Functionality was paramount for me – bad weather don’t matter, segregation guards against extensive contamination by bad soil or weeds, successive plantings for spaced harvesting of some crops is easier than rows in a large greenhouse, a large house is also more susceptible to damage by storms, …. it is also a psychological benefit by looking at the garden in one little bite at a time. Wow…looks like it works great. Love the rolled up plastic, and amazed at how long it lasts. Wow, hermit us, that is a truly beautiful set-up! So clean and weed free! And you have a wonderful entertaining area as well! I have been thinking of doing the raised beds, but experimented in the last 2 years with something like “Back to the Garden of Eden” gardening. No tilling and just adding layers to amend the soil. Has anyone had success with this? Where we moved, I now have over 80 head of wild horses. Do not know if this is good or bad yet, but I have heard that horse manure is good soil amendment and I would figure that wild horse manure is pretty organic. My father and his father only used composted horse manure – their gardens were great. Here, I only use rabbit stuff and straw in a large pile of soil – like 6 yards of dirt that I turn with my loader every year. I seems to attract many earth worms and the occasional deer standing on top of it – so far, adding a little to the planters each year has been enough nutrients for good growth. I do not have access to enough clean material to do a “garden of Eden” but it sure seems like a lot of work and years to establish? I have planted a garden in all kinds of places, from AZ to AK and now NM, but I am at 7600 feet- sort season. We have a 20×40 garden all with raised beds or licktubs. It keeps the pocket gophers out. The beds are at my level so i don’t have to bend, yes! My husband put down pavers before building the 18″ deep beds. The whole thing is enclosed with chicken wire. We use sterilized cow manure (the horse or cow manure out here have to many grubs- big ones), peat moss, and one or 2 shovels of our horrible soil. By amending it every year with the manure and peat moss I don’t have to fertilizer at all during the growing year. I cover new plants with walls of water, milk jugs and juice jugs. This protects them from the wind and another frost before it warms up in June. I always plant out in May, early but ok if you take these precautions. We have put in a dripper system as it is a lot to water and we use water from our rain catchment tanks to water. Even though we only get 11 inches of water a year, we manage, and pray for a good monsoon in July. We grow all kinds of things we aren’t supposed to and a lot of it. I have pictures. I live in a short season and Hermit us, you have a unique idea. I had used framework right on the ground with no problems, especially when I started early and protected my plants from freezing. It trapped moisture and became a lush greenhouse leaving it on for a longer time without watering it. The plastic eventually degraded over a few years from UV rays, and I scuttled the projects of growing early when I have a neighbor who has a heated greenhouse and I got lazy, getting my plants from him. Absolutely gorgeous! No wonder you never want to leave. Thanks for sharing your setup. Can’t wait to show it to DH. A lot of plants over-winter, lettuce, kale, collards, spinach. This year I would have had to dig into almost 6′ of snow to find them. In my email to Ken, I show one winter shot from a year where we only had about 4′ of snow. This is why I chose to get a freeze drier – plow the driveway, log on the fire and think about whats for dinner. sorry to post so late, but on Pacific time it is only 9:34. The most important aspect of this investment was to ensure that I did not ever have to rebuild my raised beds as I get older. Just trying to look down the road a bit. Thought about that trip to a vacation spot or these planters – same price for me and an easy decision. Thank you very much for a well thought out design. Just about everything mentioned makes sense. I am in the process of doing something similar in my own yard though much more low tech. I am using old barrels cut in half that are filled with dirt and used to grow our favorite fruits and vegetables. As I get older with physical limitations, I can relate to the idea of relatively durable retaining walls for the dirt. Thank you once again for sharing a very well thought out idea that you made into a reality. The pictures made me wonder how many years this project took? How many years have you been using this concept and how many such containers do you have in your yard? As I told NRP in previous posts, I am project oriented so this garden was done in one summer along with my 24×26 garage and a 24×36 pole building. I do similar tasks at the same time, excavate all at the same time – make one big mess only once, pour all the concrete at the same time, … you get the picture. I do all my own work but called some neighbors to help occasionally – like when I craned up the entire roof assembly onto the posts of the pole building (built it on the ground except for the metal roofing). This garden is now in the fifth year of production – working well so far. missed one question – I have 20 planters. 120′ of raspberries. 24×150 of in ground garden. 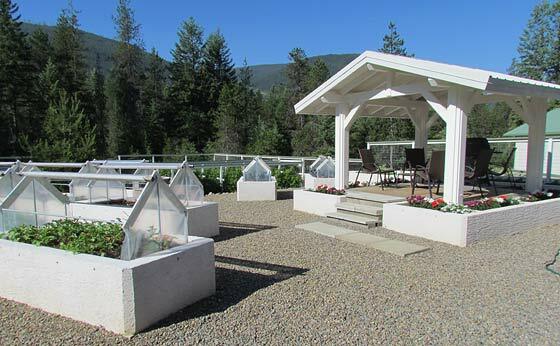 Pretty nice raised beds, money $$$$$? A former co-worker gave an idea ( if you can find them ), old, used ( I guess they wouldn’t have to be old ) cattle feed bunks. the ones that are made out of wood. 3 ft to 3 and 1/2 ft high, 4 ft across and 16 ft long ( wouldn’t have to be 16 ft long, but it would be nice ). Line them with a sheet of plastic, then a layer of weed block, then fill commercial compost, have the sides up to 12 in high. A slight incline for drainage with a drain hole at one end and something to catch run off. This co-worker had placed a drip system on his beds and claimed that they worked out fine. Just a thought. What ever is available in your area, the water situation, freeze/thaw pressure on the bunk, … but I have the equivalent of ten of those – hard to find containers not in use in my area. Sometimes you just have bite the bullet and built it yourself. 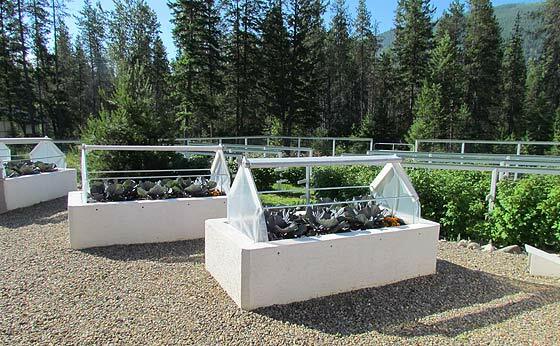 Great looking (and practical) raised beds! I should have done a better job pre-planning my garden area. Built the fence first, which somewhat limits access to equipment wider than 5′. Now that I’m considering adding gravel, that’s becoming an issue. I really like your design for the poly supports. I have the material to do something similar out of PVC, just haven’t gotten it done yet.